The Old Wellington Inn and Sinclair’s Oyster Bar are landmarks of old Manchester, a surviving group of sixteenth- or early seventeenth-century timber-framed buildings surrounded by successively more incongruous and out-of-scale developments on all sides. Similar buildings elsewhere in the centre were obliterated from the beginning of the nineteenth century. The cutting through of Victoria Street in 1837 transformed the area, and by the 1870s this little block in the Market Place was dwarfed by imposing four-storey Victorian brick buildings faced with stone. The Wellington Inn was for years made even more distinctive by the huge spectacle signs of Bowen’s Practical Optician and Mathematical Instrument Maker (Established 1809). In fact only the Wellington Inn is genuinely late-medieval: the fabric of Sinclair’s is actually brick, dating from c1800, and the link-building between the two dates from 1925. The Blitz of December 22nd-24th 1940 flattened many of the surrounding buildings, leaving this ramshackle group intact. In 1971 the Old Shambles buildings were underpinned on a reinforced concrete raft and raised 4ft 9in to accommodate an underground access road. Here they stood, completely divorced from their historic foundations and surroundings. The IRA bomb which devastated the surrounding area in 1996, though it did not seriously damage the Old Shambles, provided the opportunity to redevelop the area around the unlovely Arndale Centre. This scheme included a new road, New Cathedral Street, and an enlarged Marks & Spencer store and involved moving the Old Shambles to another, empty site nearer to the Cathedral at a cost of £1.5 million. In the process the block has been turned from a terrace to an L-plan, introducing further new material including a glass-fronted staircase and a complete new rear elevation to fill the space formerly hidden by the old Marks & Spencer premises. 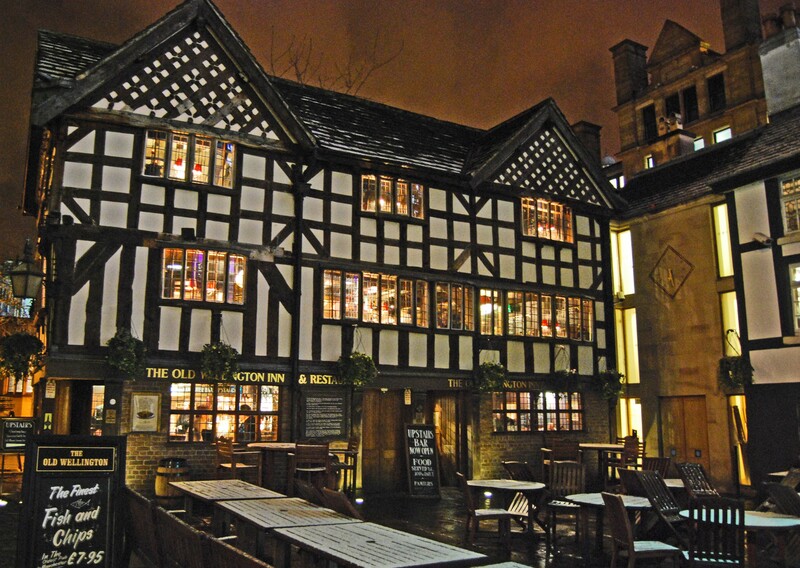 The Old Shambles is indeed a link with medieval Manchester, but it’s a tenuous link. This entry was posted in Black-and-white architecture ancient and modern, Manchester's Heritage, Survivals & Revivals: past views of English architecture on April 26, 2014 by Mike Higginbottom. Liverpool’s trio of Edwardian buildings fronting Pier Head – the Liver Building, the Cunard Building and the former Mersey Docks & Harbour Board Building – are collectively known as the “Three Graces”. The design of Liverpool’s “Fourth Grace” – to occupy Mann Island, the space next to the Pier Head group – brought lengthy controversy. The initial scheme, for Will Alsop’s design “The Cloud”, described by one journalist as a “diamond knuckleduster”, was eventually dismissed as expensive and impractical: http://www.theguardian.com/uk/2003/nov/21/regeneration.europeancapitalofculture2008, http://www.theguardian.com/uk/2004/jul/20/europeancityofculture2008.arts and http://www.theguardian.com/artanddesign/2004/jul/24/architecture.communities. The eventual outcome was the Museum of Liverpool by the architects 3XN and engineers Buro Happold, an altogether quieter building that provides a surprising amount of space for exhibits and offers superb views along the river front. Here at last are opportunities to savour some of the most significant major exhibits that could rarely if ever be displayed in the limited amount of museum space that was previously available. The Liverpool & Manchester Railway locomotive Lion, built in 1837 and latterly the star of the 1953 film The Titfield Thunderbolt and last steamed in 1989, rests alongside a reproduction stretch of the former Liverpool Overhead Railway viaduct, on which stands the one remaining vehicle from that much-mourned fleet. Upstairs, the great model of the unbuilt Roman Catholic Cathedral designed between the wars by Sir Edwin Lutyens stands before a panorama showing exactly how this vast structure would have dominated the Liverpool skyline and streetscape. Perhaps most fascinating of all, in the amount of time it demands, is Ben Johnson’s huge, minutely-detailed painting ‘Liverpool Cityscape’ (2005-8) commissioned for the Liverpool Capital of Culture Year and now permanently displayed at the Museum. These are the star attractions of a rich, constantly evolving museum that celebrates one of the vibrant cities in the UK: http://www.liverpoolmuseums.org.uk/mol/things-to-see. For details of Mike Higginbottom’s lectures on Liverpool architecture, please click here. The 68-page, A4 handbook for the 2011 Liverpool’s Heritage tour, with text, photographs, maps, a chronology and a reading list, is available for purchase, price £15.00 including postage and packing. To view sample pages click here. Please send a cheque, payable to Mike Higginbottom, to 63 Vivian Road, Sheffield, S5 6WJ. This entry was posted in Life-enhancing experiences, Liverpool's Heritage, Transports of Delight on April 21, 2014 by Mike Higginbottom. 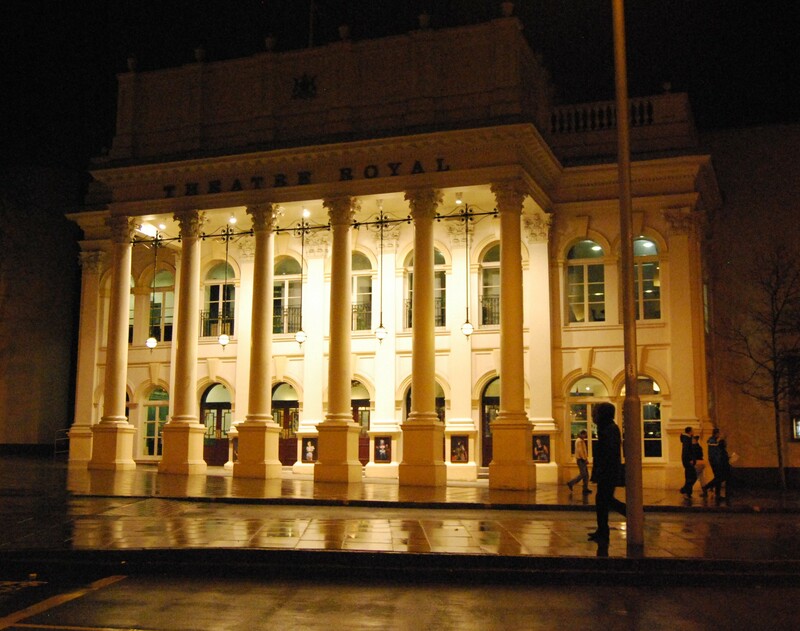 The classical portico of Nottingham’s Theatre Royal has dominated the streetscape since it was built in 1865: http://www.theatrestrust.org.uk/resources/theatres/show/514-theatre-royal-nottingham. Originally designed by the prolific and prestigious Victorian theatre-architect Charles John Phipps (1835-1897), it was modernised in 1896-7 by the more famous Frank Matcham (1854-1920), who at the same time built the new Empire Palace Theatre for what shortly after became Moss Empires partly on what had been the site of the Theatre Royal dressing-rooms. There are stories of artistes straying into the wrong backstage-area, particularly after Moss Empires took over the Theatre Royal in 1924. The Empire was also the site of Ken Dodd’s stage debut, as Professor Yaffle Chucklebutty, “Operatic Tenor and Sausage Knotter”, in 1954. The Empire closed in 1958 and was demolished eleven years later for road-widening. At a time when Nottingham City Council were planning and building the ultra-modern Playhouse as a repertory theatre, there was talk of demolishing the Theatre Royal also and building a replacement touring house elsewhere. In fact, the Theatre Royal lingered on, becoming so decrepit that eventually the D’Oyly Carte company refused to appear because of the state of the backstage areas. In 1977 the City Council purchased the County Hotel, on the opposite side of the Theatre Royal building to the former Empire, and commissioned Renton Howard Wood Levin to restore Matcham’s design, except for the proscenium arch and adjacent boxes, within Phipps’ auditorium envelope. Subsequently, in 1980, Renton Howard Wood Levin built from scratch the magnificent Royal Concert Hall behind the Theatre Royal. The two auditoria work in tandem [http://www.trch.co.uk], with the Playhouse operating at the other side of the city centre: http://www.nottinghamplayhouse.co.uk/whats-on. Nottingham has a proud claim to have been at the forefront of the late twentieth-century revival of live performances in provincial towns and cities. This entry was posted in Fun Palaces, Nottingham's Heritage, Victorian Architecture on April 16, 2014 by Mike Higginbottom. 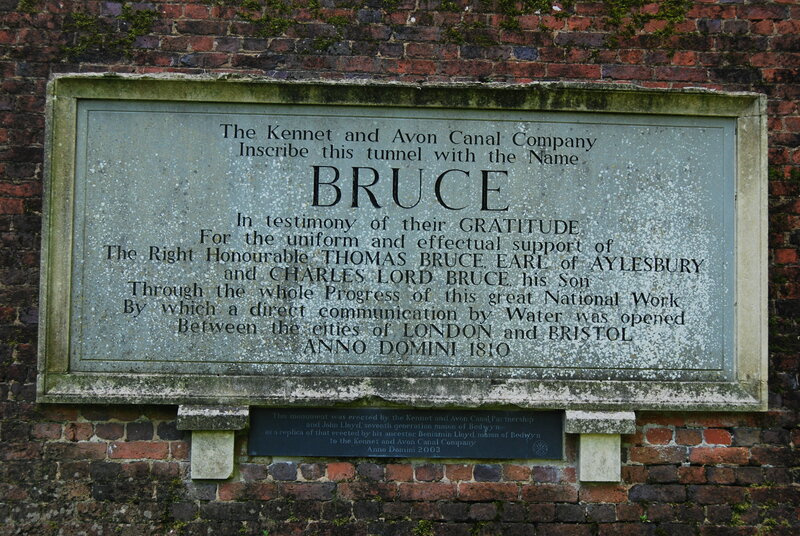 Just as the proprietors of the Kennet & Avon Canal named the Dundas Aqueduct at Limpley Stoke after the company chairman, Charles Dundas, 1st Baron Amesbury, so they named the tunnel at Savernake after the local landowner Thomas Brudenell-Bruce, 1st Earl of Ailesbury (1729-1814). Bruce Tunnel wasn’t in fact needed. It was built solely because the Earl declined to have a deep cutting splitting his estate. 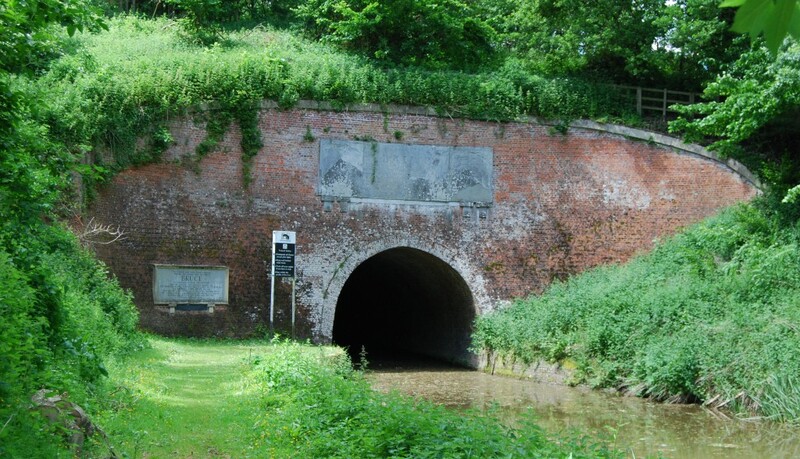 It’s 502 yards long, with a wide bore to take Newbury barges, and has no towpath. John Lloyd delivered the new inscriptions, appropriately, by boat. The 72-page, A4 handbook for the 2012 Waterways and Railways between Thames and Severn tour, with text, photographs, maps and a reading list, is available for purchase, price £15.00 including postage and packing. To view sample pages click here. Please send a cheque, payable to Mike Higginbottom, to 63 Vivian Road, Sheffield, S5 6WJ. This entry was posted in Transports of Delight, Waterways & Railways between Thames and Severn on April 11, 2014 by Mike Higginbottom. Participants in my 2012 Waterways & Railways between Thames & Severn tour were bemused when I insisted on stopping in the Wiltshire village of Great Bedwyn to look at the post office. Ostensibly it had nothing to do with waterways or railways but the building is a delight because it’s the historic base of the stonemasonry business of John Lloyd [http://www.johnlloydofbedwyn.com/our-experience], a family firm dating back seven generations to the arrival of Benjamin Lloyd in 1790 in connection with the cutting of the Kennet & Avon Canal. The post office itself and the yard beside it are encrusted with monumental panels, miscellaneous carvings, offcuts, uncollected orders, rejected pieces of all kinds. John Lloyd no longer manufactures on the site. One of the most spectacular lots sold at an auction in 2009 was a memorial to a First World War airman – a stone Sopwith Camel with an eleven-foot wingspan. 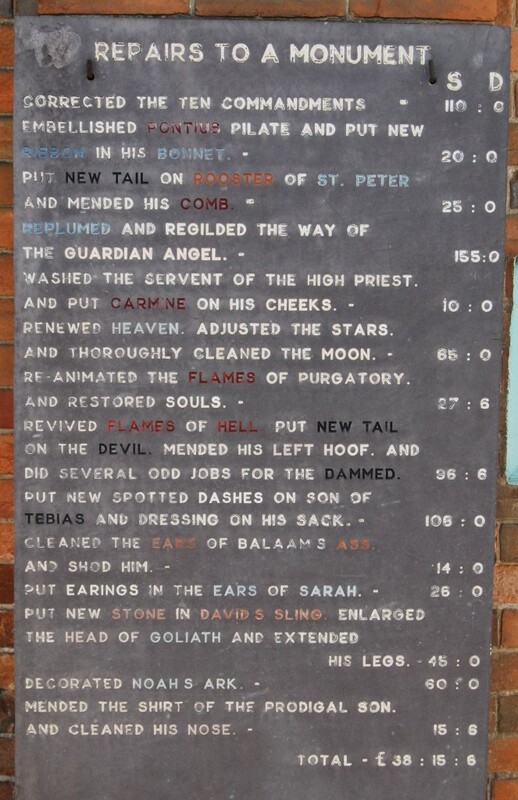 Still remaining are a selection of eccentricities, including the ‘Repairs to a monument’, an account in stone of the mason’s work and his charges. This entry was posted in Life-enhancing experiences on April 7, 2014 by Mike Higginbottom. 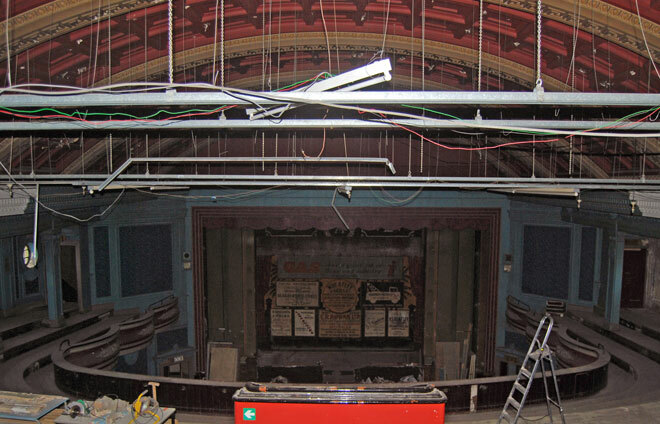 Since Phil Robins took ownership of the former Abbeydale Cinema, Sheffield, he’s tidied up the interior so that at last it’s possible to see the entire auditorium from the back of the stalls or the back of the balcony. The stage remains a forest of scaffolding until the stage-tower roof is made weather-tight. When the Sheffield Antiques Quarter Christmas Market took place at the Abbeydale I was asked to show people the auditorium, a privilege that gave me opportunity to learn more about the building. Insurance restrictions meant that visitors were not allowed on the stage or in the circle, so I provided a PowerPoint sequence showing the angles that weren’t accessible. There may have been other colour schemes that only a paint analysis will reveal: planning documents indicate, for instance, that a major refurbishment took place in 1928 and Clifford Shaw, in Sheffield Cinemas (Sheffield Cinema Society/Tempus 2001) p 101, shows a monochrome image of a decorative scheme that dates from August 1949. I’m told I was introduced on the PA system as the Abbeydale’s “resident historian”, which led a friend to enquire if I had a flat in the projection room. He’d no reason to know that in the late 1970s there was a flat in the projection suite after A & F Drake Ltd took it over as an office-equipment showroom. Later in the day I met a lady who had lived in the flat for a couple of years. She said that her dad and his mate had spent a night in the auditorium seeking ghostly presences. The only presence that appeared was her cat. Oddly, even later in the afternoon a lady asked me about the psychic history of the Abbeydale. I had to say I didn’t know there was one, but I was able to point her towards the only accredited haunted cinema, the Don on West Bar, which still exists. People were reassured to know that Phil’s plan to use the Abbeydale as a climbing centre won’t damage the listed interior: all the climbing installations will be free-standing. Indeed, one climber, a regular visitor to Phil’s existing centre, The Edge [http://www.sheffieldclimbing.com], said he was looking forward to sitting in the circle with a cup of coffee watching other climbers. Update: I read in the Sheffield Cinema Society June 2014 newsletter that Phil Robins has changed his plans: the climbing-centre project at the Abbeydale isn’t going ahead – indeed, Phil has closed his other climbing centre, The Edge,– and the snooker club has moved out of the Abbeydale’s former ballroom in the basement. For the first time in its history the entire building is empty. This entry was posted in Fun Palaces, Sheffield's Heritage on April 2, 2014 by Mike Higginbottom.